Which Is a Better Buy These Days: Physical Gold or Gold Mining Stocks? So says Shaun Connell (http://livegoldprices.com/) in edited excerpts from his original article* as posted on Seeking Alpha. The most obvious way to get gold exposure is to just buy the physical stuff or a gold ETF….but the problem with buying gold is that it’s connected only to the demand of gold. For some people, it simply does not have enough upside…and those individuals often start looking into gold mining companies…. Why Have Gold Stock Prices Lagged Bullion? These gold mining stocks do not directly match the price of gold. Since most companies sell their gold through future contracts, they may not realize today’s spot price for several months. As such, their revenues typically lag the spot price. As such, historically when gold mining companies have lagged the price of gold, they usually have a period following of outperformance compared to the price of gold. Since that has been the case for the first quarter of the year, gold mining companies could potentially be a good investment going forward…and since investing in gold mining companies is actually investing in a company, there is usually more upside potential and less downside potential compared to investing in physical gold. Over the last few years, gold miners simply haven’t kept up with gold. GDM and GDX, for example, have both trailed gold by nearly a 100% over the last 5 years…and there are others that are flat. There are, of course, penny stocks and medium miners that have done great, but most averages are level or down compared to bullion. Stocks have extra risk: They can go bankrupt. They can be nationalized. They can miscalculate their gold [reserves]. They can have accidents. They can whatever. There are literally thousands of variables that could destroy the companies in particular, much less slow down profits. Long-term bull isn’t certain: Not everyone is betting on gold for the long-term — there are a lot of short-term speculators. That’s why gold spiked so heavily in 2011, and gold mining stocks didn’t spike nearly as much — not even close. This lack of long-term certainty is priced into miners to some extent. Extreme long-term uncertainty: Some mining stocks…simply don’t have enough known gold in the dirt to last a… long amount of time. This is a risk. [Also,] it’s getting harder to mine gold…[while] gold’s price increasing can help, but it’s still a downward pressure on miners compared to gold bullion itself. 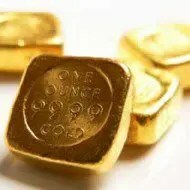 There’s a chance that gold will drop…[if] the market is convinced (rightly or wrongly) of an imminent recovery….Billionaire Jim Rogers, [for one,] believes we’ll see some strong bubble-like economic recovery over the next year or two, so there’s a chance the price of gold could dip in the meantime. Right now, [however,] the U.S. government has no real exit strategy for the insane deficits that we’re creating – except for money-printing, that is, and that means that gold prices are still a great long-term bet. Unless some sort of anti-deficit movement takes hold in the next five years, look for gold corrections as a time to buy into gold for the very long haul. Just don’t bet the farm – a well-diversified portfolio is always better than a huge lopsided bet. The above are my reasons for adding to my position in physical bullion, and not miners. Unless something crazy happens and a good deal is revealed, I’ll likely keep this position and tactic for the foreseeable future. 3. Gold Will Drop to $1,450 This Month Before a Parabolic Move to $3,950! Based on my technical analysis gold will drop to $1,450/oz. before the end of May and then go parabolic in the next C-wave to $3,950/oz. Below is a chart of how I see the price of gold unfolding over the next while. 4. The Time to Buy Gold Is When There Is Blood In the Streets and That Time Is NOW! 17. Vaulted Gold: What Is It and How Does It Compare With Other Gold Investments? 19. What Do Gold Measurements “Troy” Ounce and “Karat” Really Mean? 21. ALL There Is to Know About Gold Is HERE! If you own, or are contemplating owning…gold, you should read this article, and think carefully about the content of the 58 slides included with it – a presentation on the history of physical gold, its price drivers, what selected individuals think about it going forward, and what U.S. Federal Reserve Chairman Bernanke thinks of it. 22. New Analysis Suggests Gold Going to $3,495 in 2013, $6,233 in 2014 and Peaking at $31,672 in 2015! 23. Goldrunner: Fractal Gold Analysis Says Gold On Way to $3,500 Mid-year! 24. New Analysis Suggests a Parabolic Rise in Price of Gold to $4,380/ozt. 25. Deja Vu? Is Gold Just in a Correcting Phase on Its Way to Parabolic Peak of $4,294? Once this present correction in gold has been completed it should [undergo] the largest and strongest wave in the entire gold bull market…to around $4,500 with only two 13% corrections along the way. [Let me explain how I came to that conclusion.] Words: 19007. 28. Alf Field: Correction in Gold is OVER and on Way to $4,500+! 29. Gold’s Recent Price Action Suggests Ultimate Top of $5,000/ozt.